The PD-4 Low Profile Portable Derail is a single-end derail, available in left (PD- 4L) and right (PD-4R) hand throw. PD-4 Portable Derail with a PDF-LP staff assembly and an BF-2D derail flag. Staff assemblies and signal flags are sold separately from derails. Covers broader range of rail sizes from 70 lbs to 110 lbs. Fabricated from high-strength steel that will derail all rolling stock, including six-axle mainline locomotives, when installed properly. The height sits only 2-3/4″ above the rail. Each weigh only 42 lbs. Easily fit on the track and require no special tools to install. 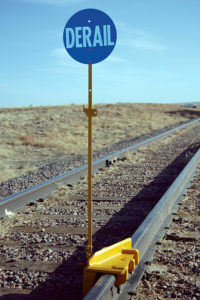 The portable derail, staff, and flag can be padlocked to the rail head to ensure visibility, safety, and security. Check out the Signal Flags page for all available flags.